Danny Jones is 65 years old (born in 1953) and lives with his wife, Tina, in Reynoldsburg, Ohio. 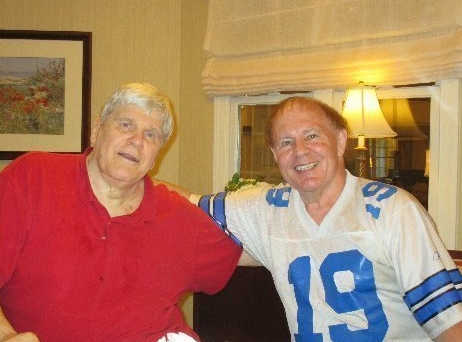 Danny's love and passion for football began during the early 60's- Pro Football's golden decade. He played amateur and semi-pro football for over a decade during the 70's and 80's. Danny was a wide receiver and compiled some outstanding statistics during his career. He caught 302 passes for 5,519 yards and 66 touchdowns. Danny scored 15 touchdowns of 40 or more yards. He wore #19 like his football hero and idol- star receiver Lance Rentzel of the Dallas Cowboys and Los Angeles Rams. Danny enjoys the simple pleasures of life. He cherishes time spent with his loving wife, Tina, and pretty cat, Rambo. The reason for these books is to give former NFL stars of the 50's, 60's, and 70's the recognition they deserve so they can be chosen to the Hall of Fame where they should be. Danny has written 5 football books, including his new book, Trailblazers and Unsung Heroes: A License to Thrill- All-Time Football Greats of Yesteryear (2018). His other books are Distant Memories: The NFL's Best Ever Players of the 60's and 70's and More Distant Memories: Pro Football's Best Ever Players of the 50's, 60's, and 70's and Lost Treasures from the Golden Era of America's Game: Forgotten Heroes and Legends from the 50's, 60's, and 70's. The book from last year (2017), is Heroes of Yesteryear: Pro Football's Dying Breed of Players from a Bygone Era.